Ted Achilles receives Pax Populi Peacemaker Award at Abbot Hall, Marblehead, MA, April 30, 2011. On April 30th, 2011, Ted Achilles, founder and director of the School of Leadership, Afghanistan (SOLA), became the recipient of the Pax Populi Peacemaker Award. In the presence of over 350 visitors at Abbot Hall in Marblehead, Massachusetts, Achilles received this award for his extraordinary work in advancing peace by extending educational opportunities to so many young Afghans through his school in Kabul, Afghanistan. According to SOLA’s website, their organizational goal is to prepare the very best Afghan students for study in the U.S. and elsewhere so that they may return home to become future leaders of Afghanistan. To this end, SOLA has partnered with Pax Populi in both its Pax Populi Educational Outreach program through which Shogofa came to study at Salem State University beginning in September 2010 and in the Pax Populi English Tutoring program, in which English language tutors in various locations have provided language training to SOLA students in the context of developing deeper intercultural understanding, respect, and friendship. Ted Achilles arrived in Afghanistan on February 14, 2003 and began a for-profit, freight forwarding company that he turned over to two Afghan brothers in December 2007. From May 2004 to June 2008 he was the Country Director of American Councils for International Education for the YES (Youth Exchange and Study) program. Then, in 2008, Ted founded SOLA. Participants in programs managed by Ted have gone on to study at Bard, Bates, Beloit, Bennington, Colorado, Cornell, Holy Cross, Houston Honors, Meredith, Middlebury, Mt. Holyoke, Nagoya, Richmond, Salem State, St. Lawrence, Sweet Briar, Tufts, Wellesley, Williams, and Yale, among others. 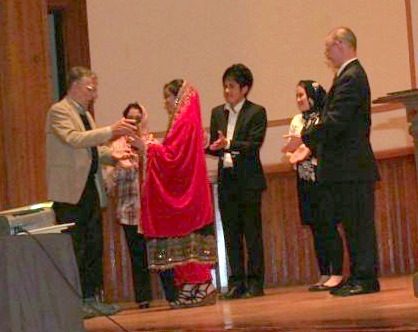 In presenting the Pax Populi Peacemaker Award to Achilles, Applied Ethics/Pax Populi founder and leader Robert E. McNulty, PhD noted that Achilles demonstrated enormous courage, kindness, and a commitment to peace by providing so many Afghans students with both educational training as well as placement services in some of America’s finest secondary schools and universities. In so doing, SOLA supports what is held by Pax Populi to be one of the three essential pillars of civil society: education. Congratulations, Mr. Achilles! We are in awe of you and SOLA. We are witnesses to the many lives that have been transformed through you and the wonderful people at SOLA, both in Afghanistan and the United States. Those of us associated with Pax Populi are honored to have this opportunity to recognize the extraordinary work you are doing, the greatness of which is found not simply in the actions themselves, but the love, generosity, and goodness from which they spring. May the spirit of peacemaking that pervades your work be blessed and continue to flourish always. As your brother in law Gary’s sister, I was very proud to read this article about your tireless efforts, Ted. Thank you for all that you have done. Congratulations on your award. You have tirelessly worked to improve the lives of many young Afghans. I am quite convinced that it is through this type of work, through educating the young people, that Afghanistan will finally find peace and prosperity. Thank you for your commitment to a better world for Afghans. I would like to take this opportunity to congratulate you on receiving this prestigious and much-deserved Pax Populi Peacemaker Award! I was delighted and proud to be one of the witnesses that day. I am enormously proud of you and of the great honor you have brought to SOLA. Thank you for your many outstanding contributions to educate Afghanistan’s younger generation.